Dr. Peter Kowynia is one of the first and only doctors in Macomb County and the Metro Detroit area to offer the amazing, new, non-surgical Obalon Balloon Weight Loss System. The Obalon Balloon System helps patients lose weight by taking up space in the stomach – so they eat less. Best of all, this FDA-approved weight loss only requires swallowing a small capsule – and requires no anesthesia during placement. 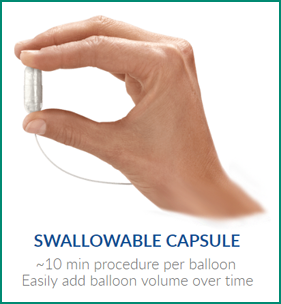 Each capsule only takes ten minutes or less to swallow and inflate. The Obalon Balloon System helps jump-start long term weight loss – helping you change your eating habits so that you keep the weight off for the long term. During Obalon treatment we will also provide you with professional nutrition and exercise support to help you implement the lifestyle changes that will promote even faster weight loss. In six months the balloons are removed. In clinical trials, after one year patients kept off an average of 89% of the weight they lost with Obalon treatments. And, while you will lose weight with Obalon alone, people in the clinical trial who combined the balloon system with a moderate diet and exercise program lost twice as much weight! The placement of an Obalon balloon generally takes less than 10 minutes. You simply swallow a capsule containing the small Obalon balloon, and then Dr. Kowynia inflates it. It is painless, so no sedation is required. Up to 3 balloons may be used for maximum effectiveness. A fully inflated single balloon only weighs about 3 grams – which is less than a penny. Once inflated, the balloon is about the size of a small orange. The balloon stays in your stomach, filling it up, so you get fuller faster and eat less! For your security & HIPAA compliance please do not submit privileged, confidential and/or protected health information.